The Centennial Mountains are a remote and beautiful mountain range lying along the Montana-Idaho border near Yellowstone National Park. These mountains, which are part of the Continental Divide, run for more than 40 miles in a east-west direction. The Centennial Mountains receive very little use due to their isolated and remote location, their steep nature and limited access points. On the north flank of these mountains lies the broad and empty centennial valley, which also contains the Red Rock Lakes National Wildlife Refuge, Red Rock Lakes and the Red Rock River. The mountains rise abruptly and very steeply up from the Centennial Valley, completely dominating the southern skyline. 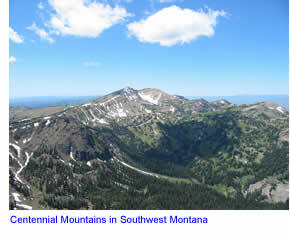 On the Montana side of the border, the Centennial Mountains are part of the Centennial Mountains SRMA, which is managed by the Bureau of Land Management (not the forest services, as are most mountain ranges in Montana). 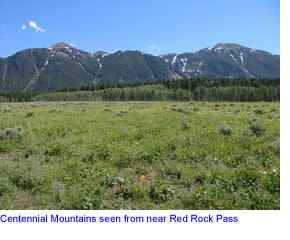 The Centennial Mountains SRMA is 26,000 acres in size, with additional acreage lying within adjacent National Forest Lands as well as in Red Rock Lakes National Wildlife Refuge. The Continental Divide National Scenic Trail cuts through the Centennial Mountains. Other than this trail, few trails will be found in the Centennial Mountains. Most hiking in the Centennials involves making your own trail through steep, isolated and rocky countryside. Access to the Centennial Mountains is both easy and difficult. It is easy in that from the Montana side, to gain access to the mountains simply involves parking the car in the Red Rock Lakes Wildlife Refuge below and heading up (no private property limits access to the mountains). It is difficult, though, due to the lack of trails in the Centennial Mountains. The lack of trails keeps all but the adventure hikers and hunters away from the Centennials. Solitude can be easily found in these mountains for the hiker that is looking for it. The best and easiest access to the Centennial Mountains comes from a road on the Idaho side of the border. This road, which leads to radio towers on the summit of Mt. Jefferson, provides the only high-altitude access to these rugged and beautiful mountains. These mountains have only limited fishing opportunities. Only a handful of lakes are found within these mountains, most of which are on the Idaho side of the border. These high mountain lakes have decent fishing for cutthroat trout, brook trout and rainbow trout. Water is also scarce when up in the mountains, so pack plenty of water and bring your own water filter.